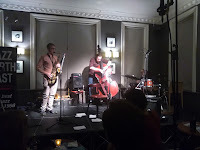 What a fabulous night of improvised music the capacity audience experienced at The Bridge on Sunday night. Headliner Daniel Levin had not appeared in Newcastle since the ‘On the Outside’ festival of 2009 and one can only say his return to the North East was an absolute triumph. The cello is one of the most beautiful of classical instruments able to evoke vibrancy and melancholy in equal measure; however, it is not commonly featured in the world of jazz compared to its smaller cousin the violin. Why this is so I am not sure, but if there was a free jazz ambassador for this instrument Daniel Levin would surely be it. One of the joys of his performance was simply not knowing what was going to happen next, for there were classical, minimalist, free, gentle and ferocious sections throughout. 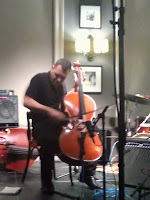 Levin seemed to employ every single part of the cello, sometimes several at the same time, as he plucked, bowed, tweaked and rapped the instrument. Anyone not in the room could have been forgiven if they had thought there was more than one player on stage. The effect was both riveting and mesmerising. Levin also added his own unique percussion effects to proceedings. These included ‘cutting’ the air with his bows and the use of what I thought at first was his setlist. Several pieces of note paper were torn, rustled and shuffled to great visual and percussive effect. A wonderful performance which I believe surpassed many people’s already high expectations of what the evening would deliver. The interval saw the launch of a new career as Zoe Gilby turned auctioneer extraordinaire as she expertly auctioned off a Gina Southgate print of an original painted at the ‘On The Outside’ festival in 2009. The print featured not only Daniel Levin but also Andy Champion who was to perform with Squeteague in the second half of this double bill. 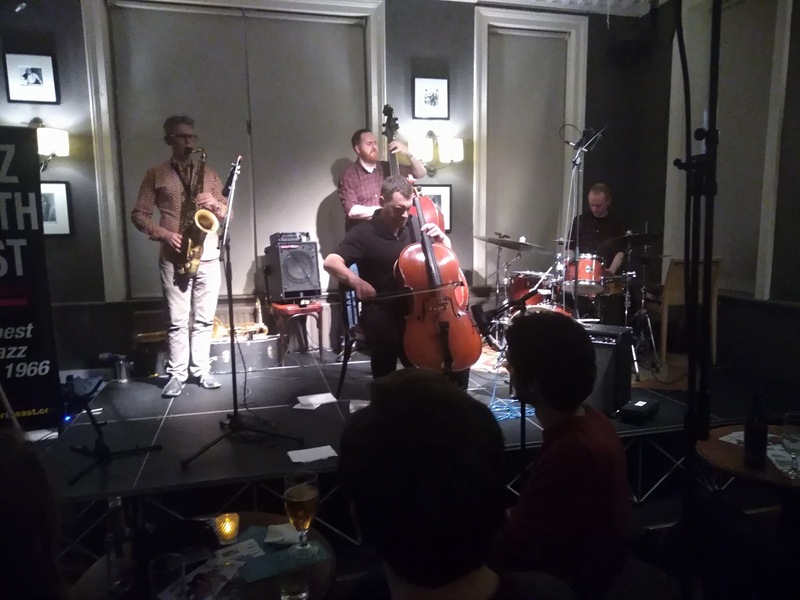 Squeteague came together in Glasgow in 2017 for a one-off gig but enjoyed it so much they decided to do it again. Jazz North East were happy to fulfil this desire. 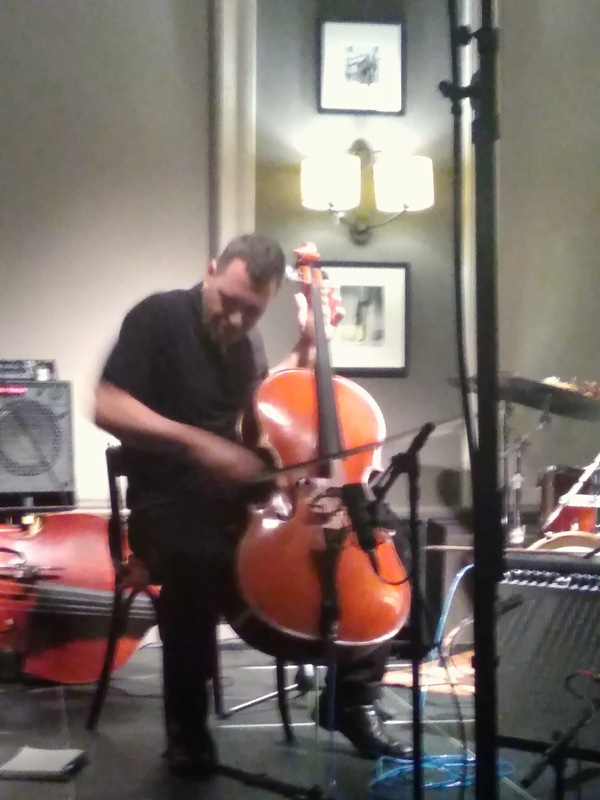 After the pyrotechnics of Daniel Levin, it took me a while to get into the set but once I did I thoroughly enjoyed this skilful and sometimes funky free improv combo. 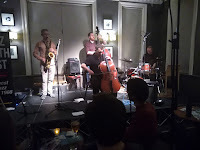 At the end of the Squeteague’s set Daniel Levin was asked to join the trio and what followed were two absolutely stupendous pieces of improvised music. At the conclusion of the performance, the audience seemed completely spellbound having been party to a memorable and life-affirming evening of contemporary jazz.